Social media and news in recent times has been filled with hate and negativity. Just as you cannot fight darkness, only light lamps, Hate and Negativity cannot be fought. You need to bring Love and Positivity forward instead. 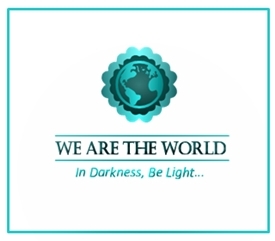 “We Are the World Blogfest” seeks to promote positive news. There are many cases of love and light out there, stories that show compassion and the resilience of the human spirit. Sharing these stories increases our awareness of hope in our increasingly dark world. The more, the merrier! 🙂 Hope you will join us! 2. All we ask is you link to a human news story on your blog on the last Friday of each month, one that shows love, humanity, and brotherhood. Something like this news, about a man who only fosters terminally ill children. This phrase “A very fine place to start” from the Sound of Music popped into my head just now and I think it applies. love your header : Will You Speak for Peace? This is great initiative, so glad to be a part of this. Love how elegant this blog looks. Seriously. Great idea! Support positive news! Thank you! I added my name. Wondering if that’s where I will post my link when the last Friday comes or in the comments on someone’s blog. That’s great JoAnna, Welcome! On the 31st, we’ll be going through the Linky list you just signed up for and sharing everyone’s post and we ask that all of those joining us do the same. If you have any questions please feel free to contact me on my contact page and I will try to get back to you ASAP! Look forward to reading your post! Reblogged this on IgniteYourCreativity.net by Belinda Witzenhausen.